When my first daughter was born, I think I was pretty stressed out, even though I had been a teacher for 9 years and looked after kids a lot, I didn’t have any idea how to look after a baby and I kinda freaked out when they placed that tiny bundle in my arms. No matter how many parenting books you read, it doesn’t prepare you for what’s next. I struggled with my emotions, burst into tears as I left the hospital, struggled for months with feeding the baby, continually worried she wouldn’t wake up when I put her to sleep, and googled every little thing that seemed strange or even the things that seemed totally normal! I guess lots of first time parents go through this too, it’s fantastic and an equally terrifying new episode in our lives! But during this stressful time it’s easy to push our spouses away and fight. Especially with my hormones going up and down, it was easy to get frustrated at my husband over little things. And it was just as easy to feel totally satisfied by this new baby that I had longed for, for years, that needing my husband was the last thing on my mind. But I quickly realized that, we were in this adventure now together, as mummies and daddies together! We needed to experience and enjoy everything together, even the tough stuff. A lot of times when I let him do stuff, he didn’t do things quite how I wanted, I thought he was a bit rough with Kara at times, or that he didn’t do the housework the way I wanted. And he seemed totally relaxed and not worried like me. And everything he did just wasn’t quite right: cue arguments! But that was just my fear and over protectiveness taking over. I needed to learn to overcome my fear and trust God, that he is in control of my little daughters life! The Bible says we should understand and support our husbands and let him provide leadership in our lives. But sometimes we can want to control our family life and be the boss and leave little space for our husbands to take that leadership role. Especially if our husbands are not around a lot, we can feel bitterness towards their absence and push them away more. But we married this man for a reason, so we also need to understand and support our husbands role as leader and let him lead and be involved in our family life. Sometimes we just need to let our husband be the leader he is! So I made it a priority to let my husband be involved, here are my reasons why I think it’s so important that we don’t just fall in love with our new baby and be protective over their every little need that we end up pushing our husbands away, but let him become a cherished and significant part of our new family life. And he is an essential part of the family. My daughter loves her daddy so much, he is funny and adorable and makes us all laugh and have fun! He can turn a stressful situation into a joke and lightens up our lives! And he is the opposite of me! If I had blocked him out from looking after Kara at the beginning and tried to do everything myself, I don’t think they would have had such a great relationship as they do now. She loves spending time with him, and doesn’t need to cling to me. Kara doesn’t care if daddy makes mistakes or is a bit rough, in fact she loves it, so I need to let him be who he is with her too! I know my kids will be more secure as well having their daddy around and involved a lot. Because he is the leader in our family and having him as a dad is essential to our families success! Maybe you feel that sometimes seems your husband doesn’t want to play that role in the family or is too busy, but sometimes we don’t realize that it is us pushing our husbands out of that role, because we want to be in control or we feel we know better about child rearing. Letting him be part of our family life, means when he is around letting him look after the kids by himself more, asking him to watch the kids or look after them and encouraging him when he does. Saying things like “I like the way you played with the kids” or “Thank you for disciplining them that way” or “Thank you for looking after them earlier” shows our appreciation of his role in our family life and encourages him to be more a part of it. Sometimes we just need to offer our husband his place in our family and encourage him that he is a vital part of it. Also showing our husband that we trust him to take care of the kids and respect his role as father is important too. When we show this he can really live up to his role as father and husband more. The more we push him away, the more insecure he will become as a father and husband. Other ways dads can be involved is by letting them do stuff around the house to help! Actually they are happy to help if we just ask. At the beginning I thought I had to be super mum and do it all myself, but that’s not necessary. I would just end up burnt out and eager to complain. It can be easy to look at the negatives and complain about what our husband is not doing when we feel like we are doing it all. But sometimes we need to be willing to let our husbands do stuff. When I let my husband do stuff, I can get a lot more done, leaving me time to spend with the kids. At first I just expected him to do it, and got frustrated when he didn’t realize anything needed doing. So I learnt to just ask “can you do this?” He is happy to help and we get things done a lot quicker, even if it’s not up to my perfectionist standard, I also had to learn to let that go and be more thankful of what he is doing. When we are thankful, rather than complaining our husbands are more willing to help more. Sometimes we just need to ask! Sharing the fears, the tough stuff, the emotional stuff, the joyful and fun stuff too, sharing it all makes our marriage stronger. If I blocked him out, it would be easy to get emotional and frustrated by myself. But this is a marriage and we need to share it together. That means I talk with my husband about my fears and the good stuff, we can understand each other and support each other more. I think this is essential when parenting we are going through a totally new experience, that is more crazy than anything we have ever experienced and there can be a tendency to just bottle it all up inside and not share how we really feel, because we think that’s how we should be as parents, ‘strong for our kids!’ But sharing the ups and downs is essential to get through this, and it makes us closer and our marriage stronger. Make time to share with your husband how you feel and what is going on in your life as well as listen to how he feels about his role in the family. Letting him be involved more gives me time for me! Since I let him do a lot with the kids when they were little they can trust him and love to be with him, so when number 2 came along it was easy for Kara to go off with daddy and have fun whilst mummy looked after Ted. It also meant when I need a break, daddy can look after both of them and I can have time to myself or hang out with my friends. Again all I needed to do was ask! He is happy to give me a break sometimes! And he appreciates my hard work, so now he often asks me if I need a break, or offers to cook dinner. We can spend all our time feeling that we have to do everything by ourselves and carry the whole weight on our shoulders, but we will become burnt out and frustrated, so why not ask our husbands for a little help! 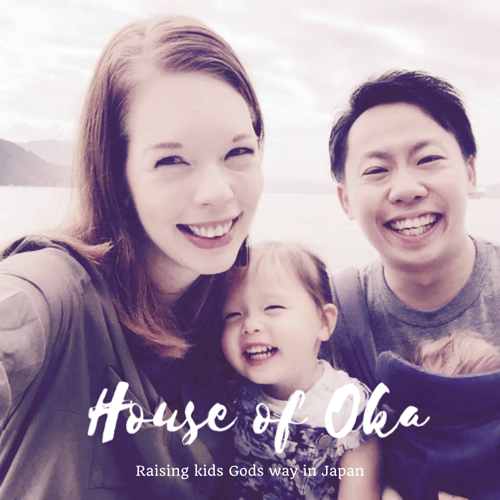 I understand that in Japan, dads work long hours and they aren’t often around, but when they are it’s our job as wives to let them be involved as much as they can and not harbor bitterness towards them for not being around enough. If we are feeling those kind of feelings we need to talk to our husbands more about it! Our husband is also our helper and the leader of our family and sometimes we just need to give him space to be involved! How do you let your husband be involved in your family? Or how have you struggled in this area too? I love this. I too struggled with letting my husband get involved in the housework and taking care of our two year old daughter. It wasn’t until recently that I became pregnant with our second child that I had to learn that just as I am to support him, he is there to support and help me. He may not do things how I do them, but he gets the job done. Thank you for sharing this.